Providing you the best range of pet jar blowing machine, bottle blowing machine, pet bottle blowing machine and pet blowing machine with effective & timely delivery. 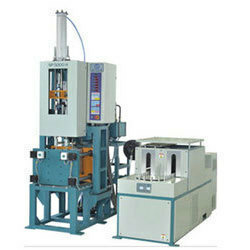 We are leading supplier of Pet Jar Blowing Machine. Our machines are known for the easy operability and requirement of minimal maintenance. The machines require minimal power and are extremely safe to use. 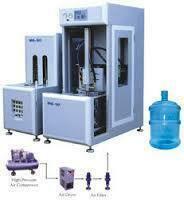 Being a well established organization, we bring forth an excellent assortment of Bottle Blowing Machine. Our provided machine is manufactured by our skilled professionals utilizing quality approved raw material and advanced technology. Our offered machine is widely appreciated by our prestigious clients for its precise design and easy installation. This machine can also be availed in various sizes, designs and other related specifications at market leading rates. 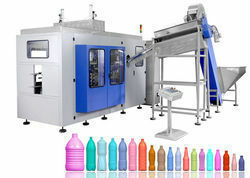 Catering to the variegated requirements of our clients, we offer an extensive array of Pet Bottle Blowing Machine. The given machines are used for blowing out crushed bottle, thereby making them fit for reuse. The product is designed under the vigilance of our proficient professionals who maintain all quality standards laid down by the industry. We make use of superior grade components and hi-end technology while designing these machines. Besides, customers can get these at industry leading price. We are a noteworthy firm engaged in offering PET Blowing Machine to our valued clients. It is highly appreciated for its less energy consumption, rugged design, smooth finish, easy operations and minimum wastage of water. 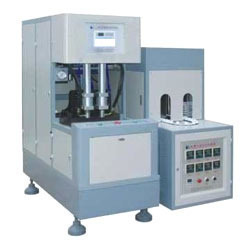 PET Blowing Machine is well checked by our experts and thus ensure our clients the maximum benefit. We offer this machine in the promised time frame at the most affordable price.